Today was a great day to be out working on the PCT! 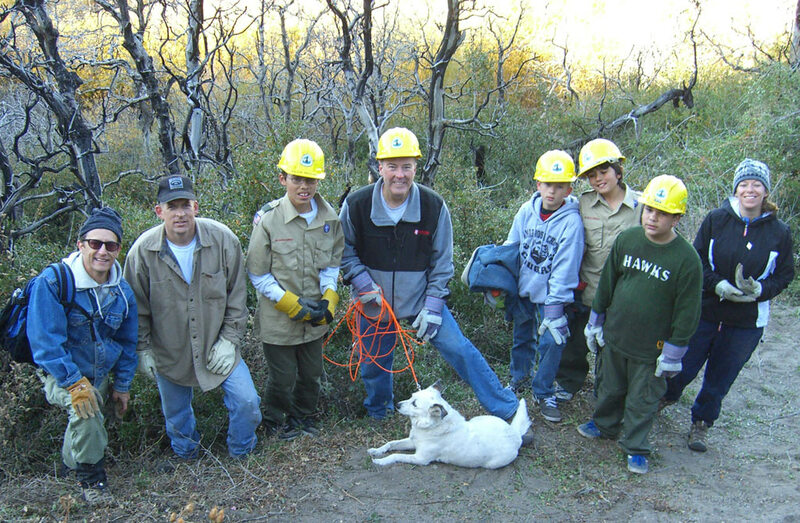 After Pete and the PCTA Trail Gorillas cleared trail this week, Palmdale Scout Troop 17 was out today to clear the cuttings off the trail. This general area remains the most-worked part of Section E, due to the 2004 Pine Fire and heavy precipitation of the following winter. Now the chaparal is growing back with a vengeance! The PCT out here is likely to see increased traffic with Sec D closed now, but that's good, and with more trail users, the maintenance work is enjoyed by more people. Pete and the TG's continue brushing the Pine Canyon area. We changed the tossing day to 11/21, with a troop of Scouts working a service project. If anyone wants to join us, we'll be working behind the sag pond. Easy walk in, light work for all who decide to join us. Contact me for more info. Wanted to let everyone know that although all or nearly all of Section D will be under closure until 9/30/10, Sec E is open for trail users. Since the Liebre / Sawmill area gets its share of hunters, I advise hikers using the PCT in that area to wear bright clothing if they hike out there. The trail is in good shape, and recent reports are that no blowdowns are across the trail. Also, PCTA Trail Gorillas will be out periodically in the next 3 weeks to cut brush in the stretch by Pine Canyon Road, and local scouts will be clearing those cuttings on November 14. Section hiker John Crawford hiked the Lake Hughes Road to Pine Canyon Road segment last weekend and reports blowdowns across the trail on the north slope of Liebre Mtn. Ref attached graphic, 001 is the highest one up the mountain (34-43.630 x 118-39.671) then many from waypoint 002 continuing north of Horse Camp (HC). Waypoint 010 is a blowdown just above the hilltop turnaround. All blowdowns do not exceed about 20" dia. January 10 marks the last of the brushing - for now - in the Spunky-Dowd segment. Congrats to Pete Fish and the Trail Gorillas, and to the adopters, the High Desert Runners! Work will continue, but this heavy brushing started 26 months ago, and is, for now, complete.